The ANA Money Show was not as active as dealers had hoped. Wholesale was decent but retail was not as heavy as the recent Baltimore Show. However, the big news that came out of this show was that PCGS and NGC will start grading coins with a +. Submitted coins with extra eye appeal will now receive a plus sign next to the grade. PCGS has already begun this transition and NGC will have it in place within two months. It has been at least 1 ½ years since Deep Mirror Prooflike Dollars have shown any strength, but it is quite clear that they are on the radar now. 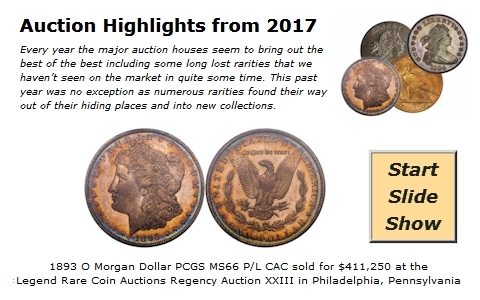 It has also been quite some time since there had been such a selection as there was in the Heritage Signature Sale at the ANA Money Show. The market for DMPL Dollars is not all positive, but there are enough increases to feel that this area of the market is much more solid than it has been. There was competition for the majority of the coins in the sale and that is much improved over the last year. Dealers will be anxious to see if this new strength continues in the short term. The overall market is mostly steady at present Market prices, yet, we continue to find some minor downward adjustments in most series. Most of these decreases are likely resulted from anxious dealers looking to increase cash reserves. And buyers are being a little more selective and are waiting for the best deals. This week's HD Wholesale Market Dealer Price Guide exhibits mixed adjustments depending on the series. Even though there are not many changes in Seated and Barber halves, these two series have a great collector base. Just about any nice coins for the grade will be quickly purchased at current Market levels. Better dates, or low pop coins will command premiums as long as they are problem free.